The location area of the Ancient Near East is mapped differently by different governmental and academic organizations, but is generally agreed to be the northeastern countries of Africa, the Eastern Mediterranean countries, the Arabian Peninsula, and Mesopotamia. Some have it reaching into as far as what we know of as the Middle East. Art began to blossom in these areas, in Mesopotamia specifically, in the 3rd millennium BC and goes back even further past the 8th millennium BC to the Neolithic era. Mesopotamia spawned the world’s first cities and its some of its first art. Much of the inspiration for Ancient Near Eastern Art came from the relationship between the natural world and the world of the gods, except in Egypt where the Pharaoh sometimes replaced the divine in art. Beginning in the ancient civilization of Sumer, the land from which we have the one of the first formal examples of written script as well as the first literature, the art of ceramics, sculpture, and metallurgy gained sophistication not before seen. 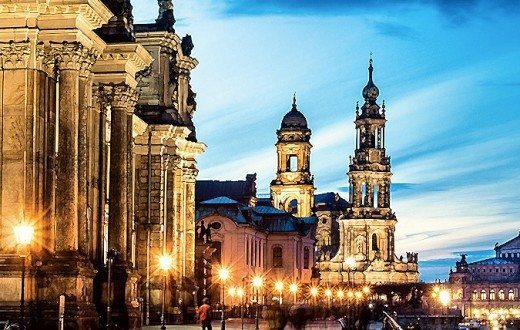 For the first time, humanity was organizing itself into urban civilizations known as the Urban Revolution. In what is now modern day Iraq, cities like Ur and Babylon became cosmopolitan meccas with definitive social hierarchy and status. While wealth was built from agriculture, status was dependent on governmental rule or from relationship to religious status. These themes come into play within the images they created. Steles are a great example of the exaltation of royalty and divinity. Pyramids, temples and ziggurats are also examples of the reverence for greatness. The Stele of Hammurabi is seven feet tall and commemorates King Hammurabi, the first formal lawmaker from whom we get many of our own laws today. 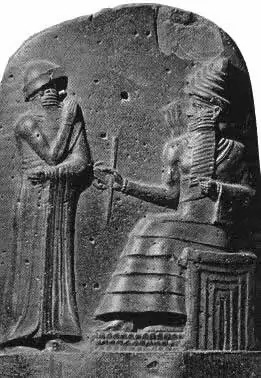 At the top, the stele depicts Hammurabi receiving his royal insignia from the god of justice, Shamash. The lower part of the stele is the written laws. Steles like this were placed publicly so that citizens would have anytime access to important public information such as the law. This sophisticated art form was important for both aesthetic and educationally progressive reasons. Reliefs on palace walls and public buildings told the stories of the peoples of a land, in particular the glories of victorious battle. These reliefs are done in stylized detail and with attention to good composition. These reliefs were done in a narrative style that told the story of battle, whether it be against rival armies, or hunted animals. Rulers in the area showed their influence and power through the architecture they built and would leave behind. 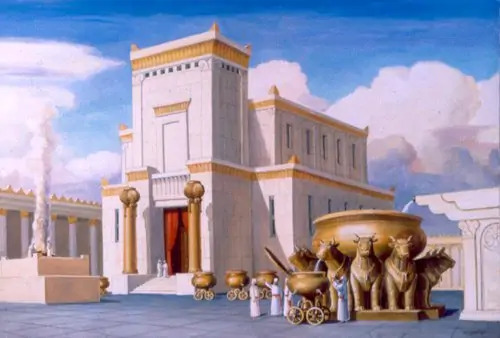 Some of this architecture was built as a gesture of worship to a particular god or goddess, such as in the case of the original temple in Israel. Nebuchadnezzar II, of biblical fame, built a gate in honor of Ishtar. With bricks of blue, gold, and black glazed paint and a gate covered in lapis lazuli, the gate would have shined like a jewel from quite far away. On approaching the gate, viewers would have seen bulls, dragons, and flowers decorating the surrounding wall in honor of the goddess. The metallurgy of the period was detailed and crafted in ways that have not been improved upon to this day. Drinking vessels and vases were formed into near perfect representations of animals and finished with relief etchings of natural scenes. Ceramics were both beautiful in form and highly proficient function, and were even whimsical in design. Stone, ceramic, and semi-precious stone seals were some of the earliest pieces of art in the Near East, dating as far back as the fifth millennium BC. Their depictions of gods, demons, animals, rulers, and nature give researchers an insight into the minds and cultures of the ancients. 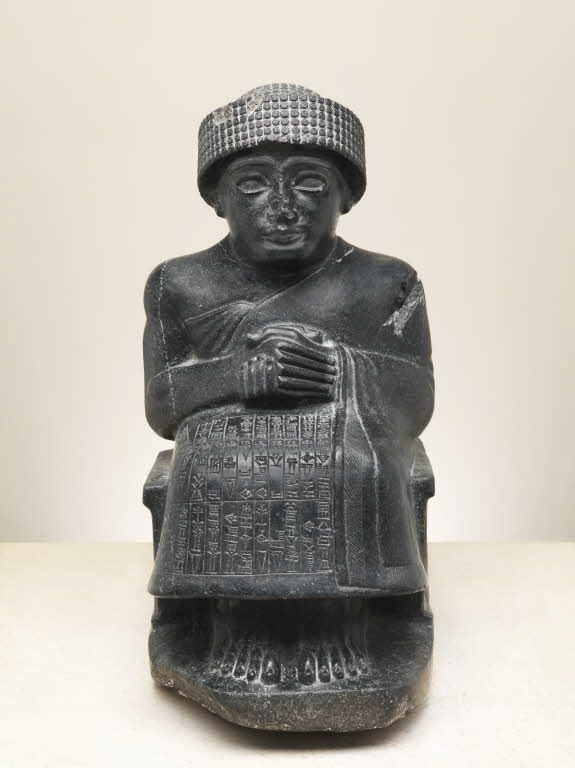 Statuettes and votive figures played prominently in the lives of ancient near eastern peoples. They mainly represented gods. 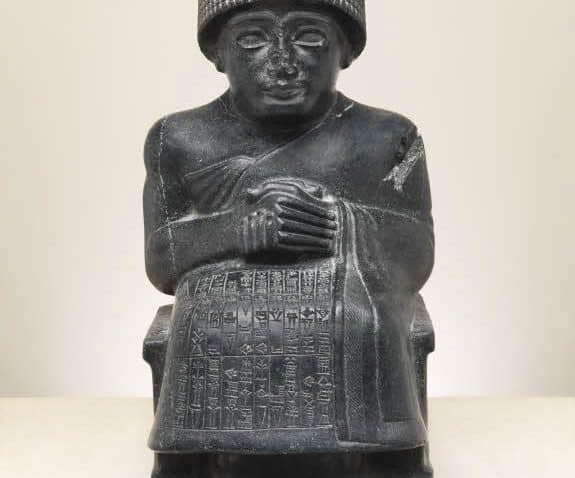 Some figures from the Early Dynastic period have cuneiform etching on the back that labels the god and the name and profession of the person who gifted the figure. Details of fashions indicate to modern scholars and to the people at the time, the nationality and status of the person depicted. Hair styles, beard styles, and clothing norms of a people distinguished them and those things are represented in the art works of the period. 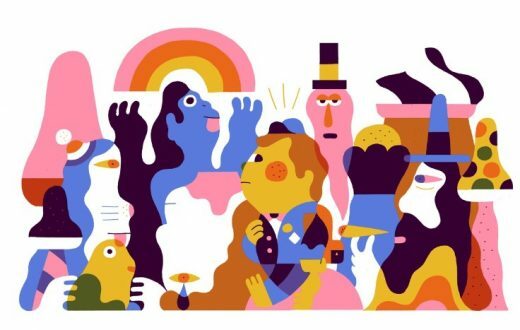 Historians are able to piece together ancient legends and stories into what may have really happened from discovered artworks, steles, and narrative images.